I’m always on the look out for better ways to pack but recently, I discovered the most ultimate packing tool: compression bags. Our friend came to visit us in Japan with just a tiny carry on. He had so many changes of clothing though so I didn’t get how he got everything in there. On the last day, as he was stuffing green tea latte souvenirs into the side pockets, I saw a weird large ziplock bag. He squished it and my curiosity got the best of me. Turns out it was a compression bag – apparently all the rage with backpackers. Thing is, I’ve never gone backpacking. And…I’m pretty sure if I ever did go backpacking my bag would be comically large. Anyway, the way it work is, you put your clothes in the bag, seal it, and then roll it to squish all the air out through these two small vents at the bottom of the bag. It squishes your clothes into a tiny, tiny package. Of course, you clothes come out all wrinkly, but if you’re just using it for bulky, squishy things like sweats (let’s face it, my main wardrobe choice) then you’ll be just fine. Speaking of squishy things, have you guys ever tried tofu puffs? They’re soft and airy cubes of tofu that have delightfully hollow insides. They’re chill, don’t try to be anything else, and are kind of the sweat pants of the tofu world. 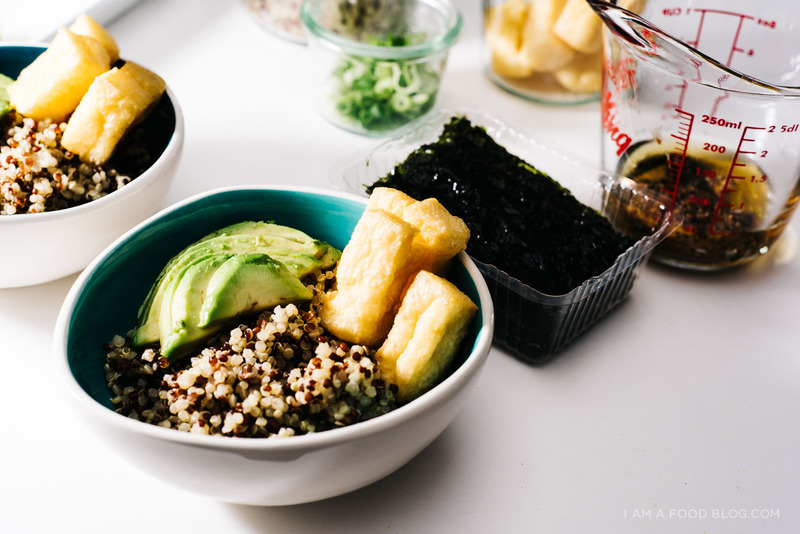 Tofu puffs are my life and I basically built this bowl around them. I could eat them morning, noon, and night. I just open up a package and snack on them plain. 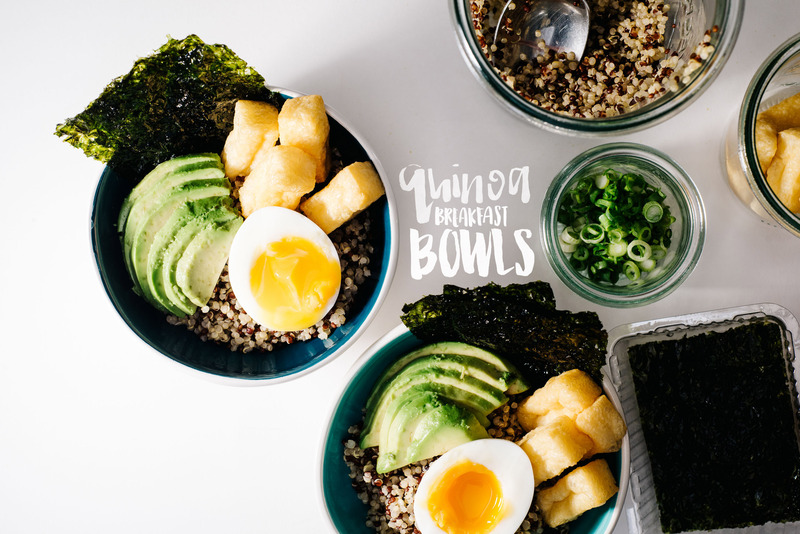 But, I totally get it if you don’t eat plain tofu puffs so here’s a little breakfast bowl that’ll get you through the day. 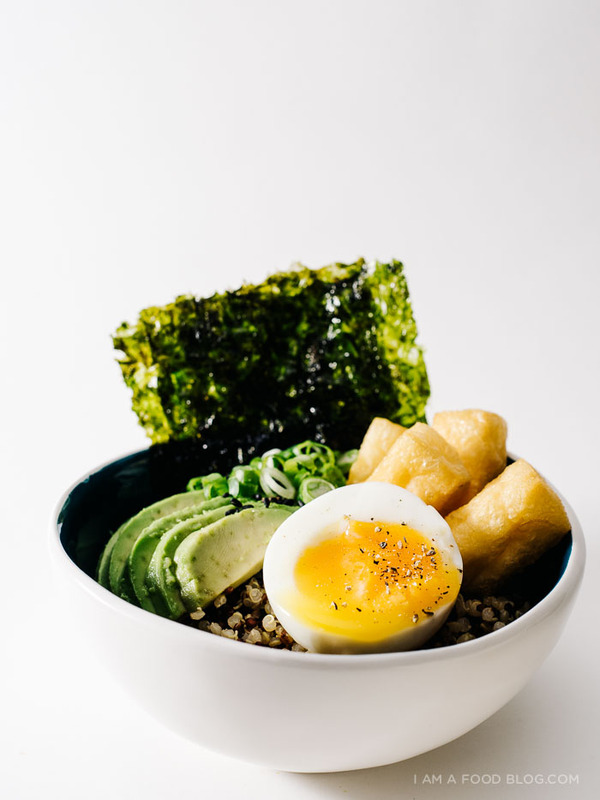 Creamy avocado, a six minute egg, tofu puffs, and seaweed. 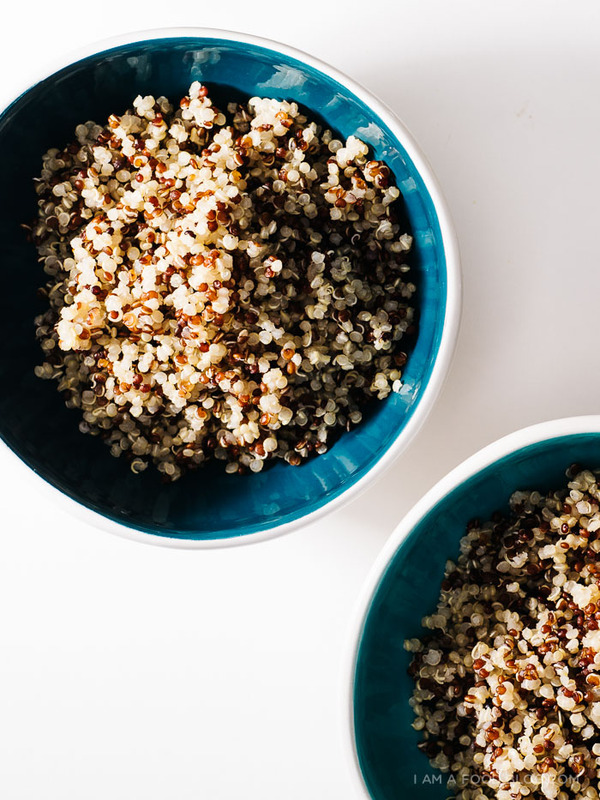 Super protein-full and super delicious. See, I’m not all carbs all the time! Okay, who am I kidding, usually I am all carbs, all the time. Set up for boiling the eggs by preparing a large bowl of cold water and ice. Set aside for when the eggs are done. Bring a pot of water with 3 inches of water up to to a boil over high heat. Reduce the heat until the water is barely simmering. Using a slotted spoon, gently add your eggs and set a timer for 6 minutes for super soft and 6 minutes and 30 seconds for a yolk that’s just a tiny bit more set. When the time is up, use the slotted spoon to remove the eggs and immediately plunge into the ice water bath. Peel carefully. Make the dressing: Whisk all the ingredients together. Taste and adjust seasoning if needed. 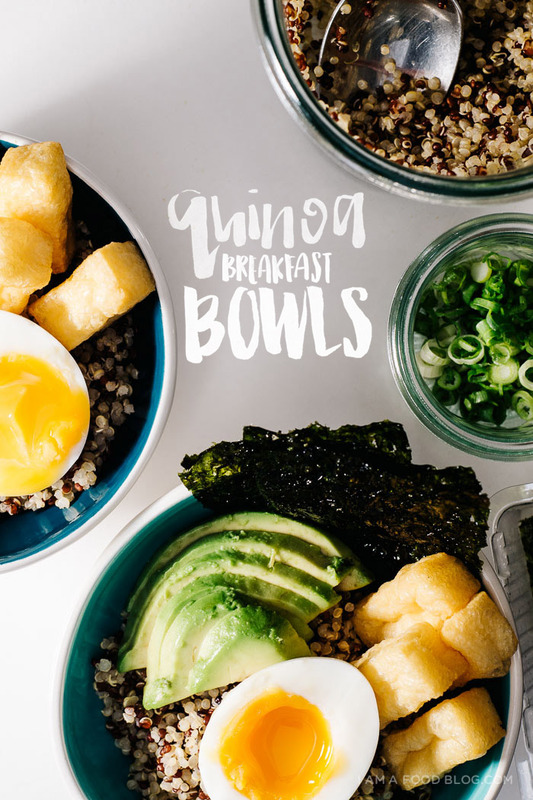 Divide the quinoa amongst two bowls and top with eggs cut in half, avocado, tofu puffs, green onions and seaweed. Dress to taste with the miso mustard dressing. Do not forget the green tea Kitkats! I am hopeless packer; yet the upside is I always pack less to make room for gifts (aka Food and snacks). Hehe we’re on the same page I think– I’ve always wanted to backpack but I would probably be the world’s worst packer ever… like, will we need this waffle iron? Maybe??? I bring zis waffle iron, yesss? ;) I’m a rather good eater, though, so feel free to send me a bowl….mmm! The egg looks perfect! And I’ve never heard of tofu puffs before, but it definitely sounds like something I would love. Good packers are like magicians. It’s like, a special superpower. I do not have it. Love me anything with an egg and I love the looks of this, especially the dressing. Cheers! I need to find tofu puffs!!! 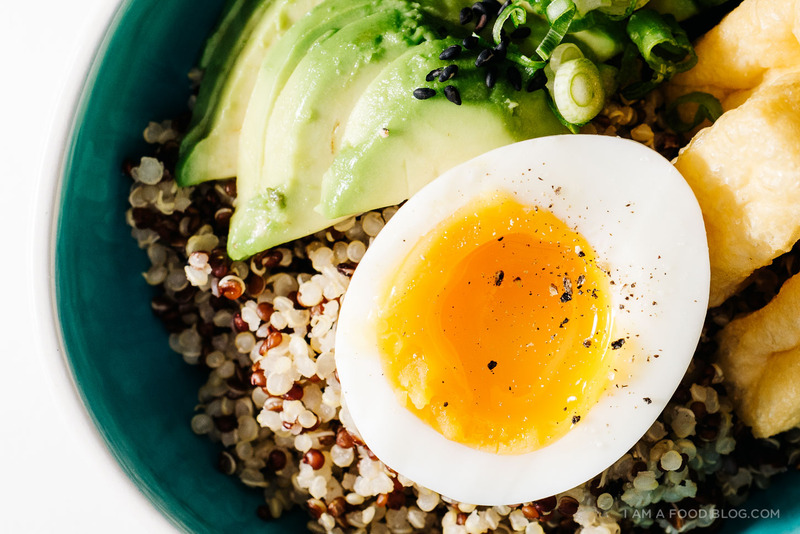 We’ll, I’ll have to check the Asian markets to see if tofu puffs are available here in Sweden, but I’m totally having quinoa and soft boiled eggs for breakfast tomorrow! Steph, you know how much I love brunch, right? I totally love every bite of this dish, especially that egg. And compression bags is a must! I carried it when I travel overseas…and still need an extra luggage of snacks and all goodies, especially when I come back from Japan! My mom is the best packer. She can take 50 pounds of stuff and fit it into a 6 inch box (slight exaggeration. . . but close). I’ve never heard of tofu puffs but they seem like they might add an interesting texture/crunch to a dish. This is a beautiful dish full. The sweatpants of the tofu world–I love that. 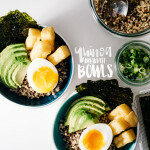 This breakfast bowl looks great. 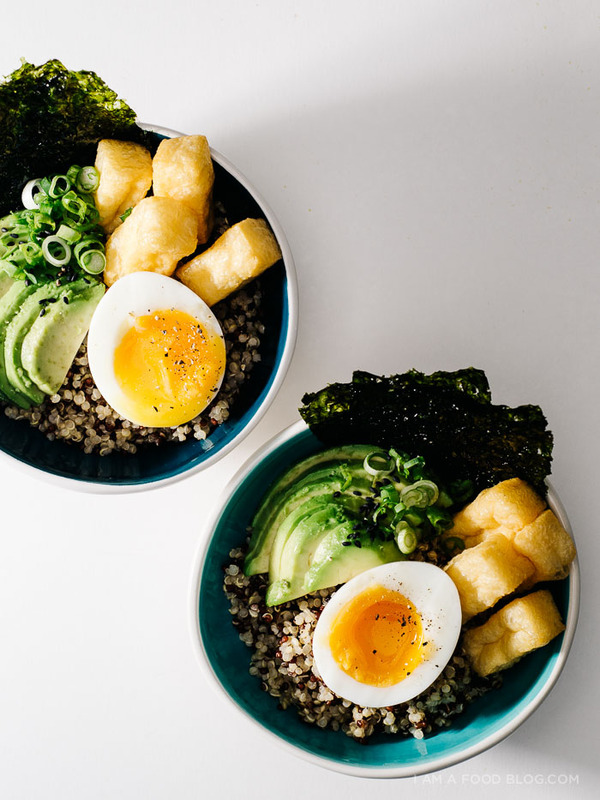 I’d guess that the textural differences between the quinoa, the tofu puffs, and the avocado/eggs would be delightful. 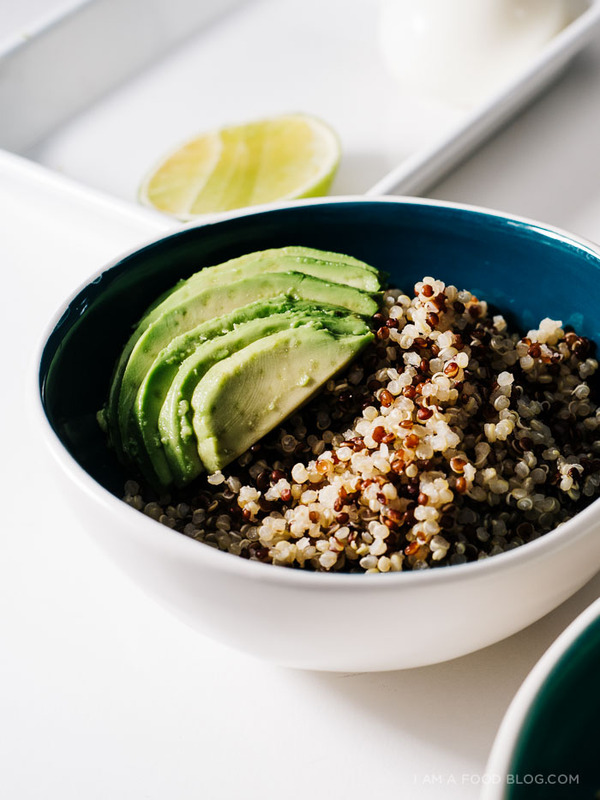 This Quinoa Bowl looks delicious! Can’t wait to try it!! I’ve yet to try tofu puffs, but you’ve combined some of my favorite things here. Looks like the perfect breakfast to me! Hehe my friend and I were just discussing how many Uhauls it would take to get me out of my current apartment. Yeesh! Still, good thing you do hearty breakfasts and all that jazz, yeah? YUM! I love tofu puffs! Where do you get the tofu puffs?? Yum!! Those eggs look amazing Stephanie!